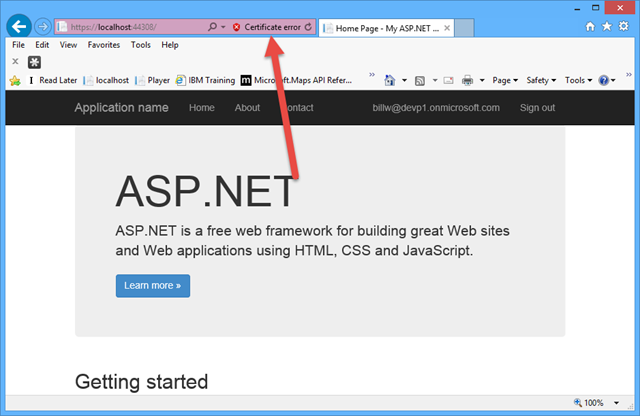 If you are developing applications that authenticate users or handle sensitive personal or business data, you should be using SSL for your whole site. That’s the most secure approach. 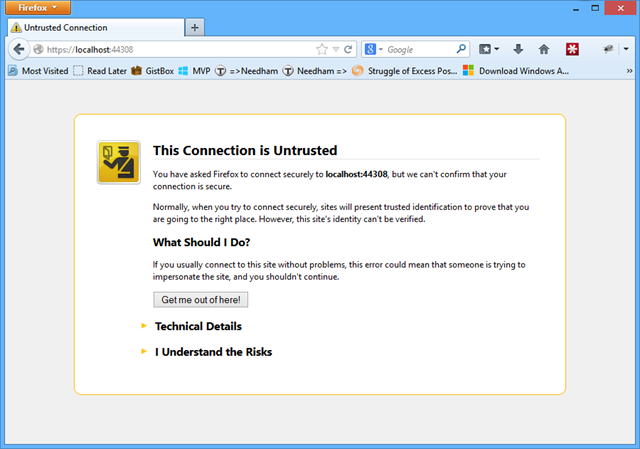 Plain old HTTP is not gonna cut it, and flipping between HTTP and HTTPS exposes undesirable vulnerabilities. 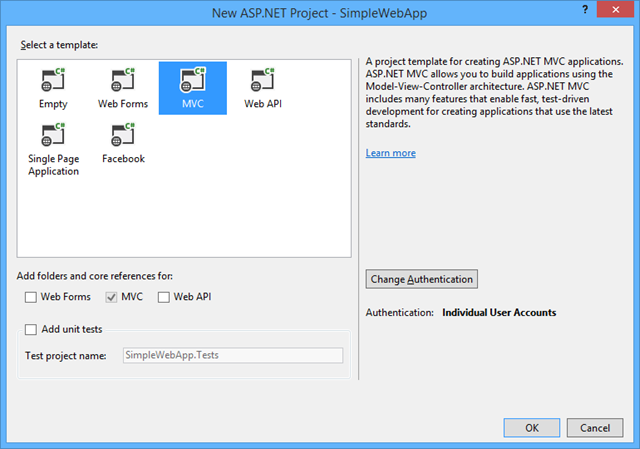 So let’s suppose you are building a Windows Azure Web Site using ASP.NET MVC and you want to take advantage of Azure Active Directory for authentication. 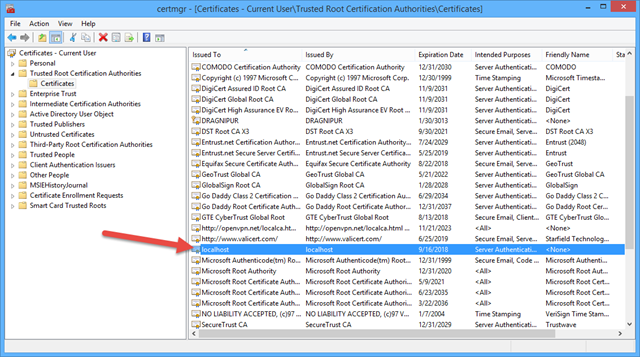 Maybe you create an Azure Active Directory account, add some users, now you are ready to use it for authentication within your application. 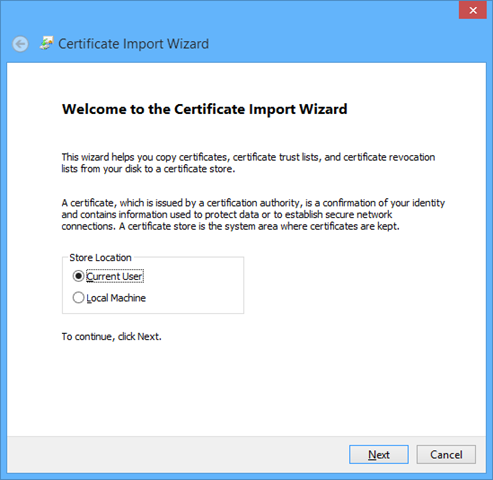 The Certificate Storage on Windows (desktop and server) is a trusted location for storing digital certificates for all kinds of reasons, including those used by Web Browsers to trust whether or not to trust an SSL connection to a web site, or whether to give a warning. 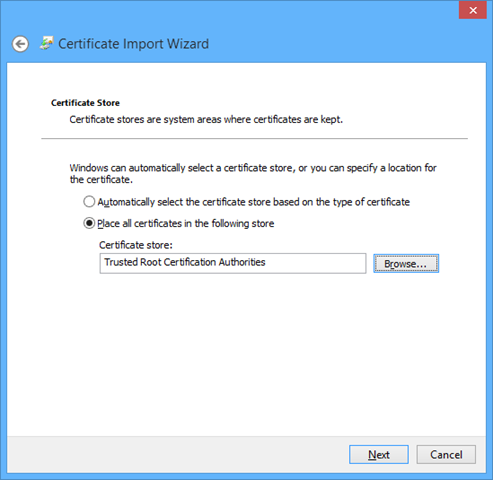 Only certificates that live in a special location in your local Windows Certificate Store – or digital certificates signed by those certificates (or in a signing chain) – are allowed to be used without a warning. 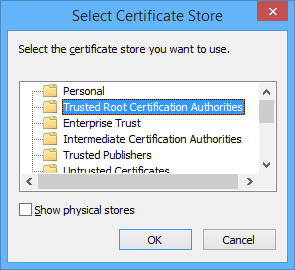 This special location is called Trusted Root Certification Authorities. 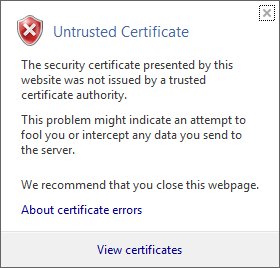 If your certificate is not in there, or itself was not signed by a certificate in there, and so on, then the browsers will show the users a stern warning. 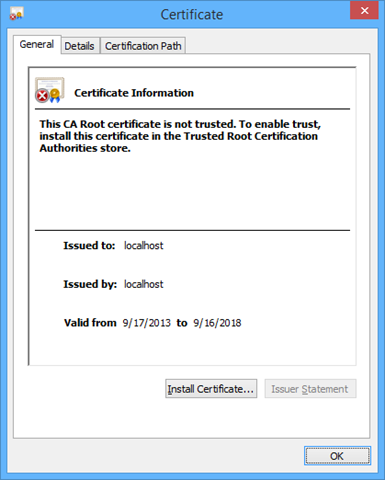 You can view the certificates in your Trusted Root Certification Authorities store by running certmgr.msc from a command program. Here’s what it looks like on my machine. We’ll come back to this tool later. 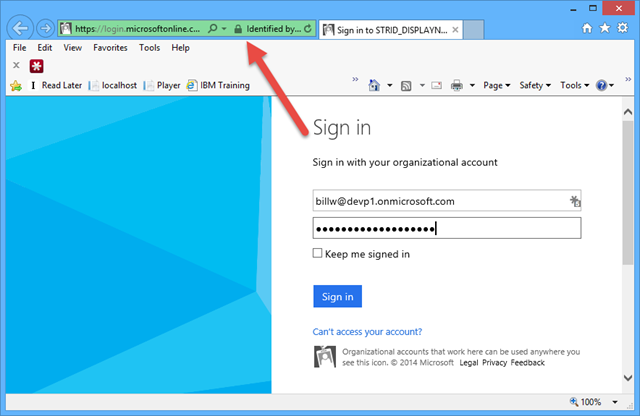 Slect Organizational Accounts in the radio button on the left, and type in your AAD domain (could also be Office 365). 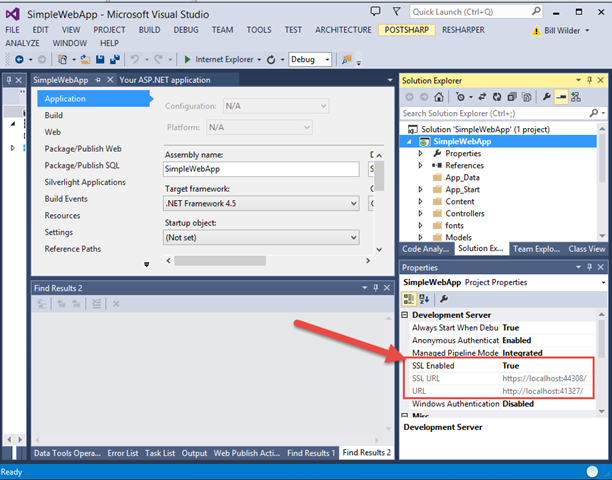 Choose Single Sign On for Access Level for simple authentication, or choose Single Sign On, Read directory data if you also plan to use AAD for authorization (such as RBAC). 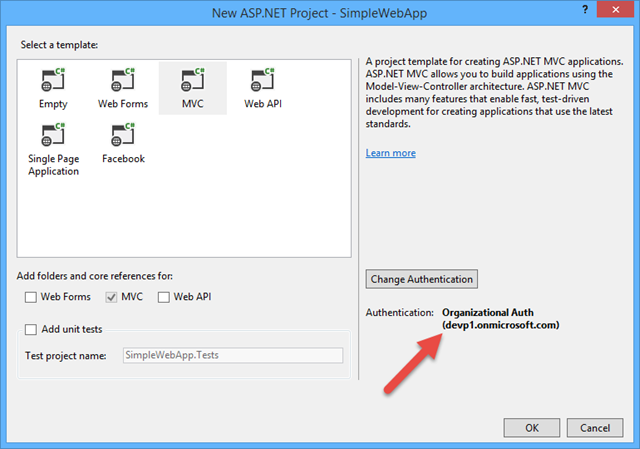 Click OK.
After authenticating as a Global Administrator user on the specified domain, you will be back to your New ASP.NET Project dialog, though with a new value for Authentication setting. Click OK. Now your project will be generated. 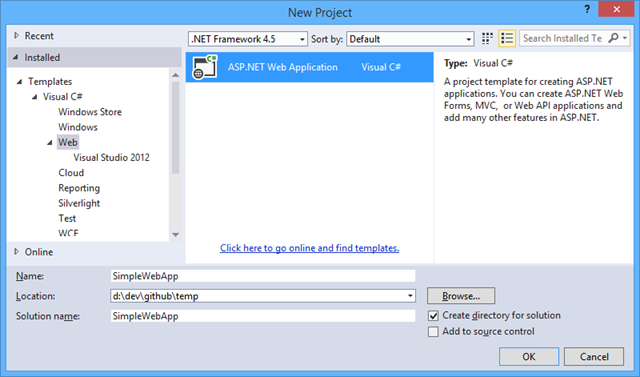 If you display the Project Properties window for your project, as shown below, notice the configuration options for SSL. 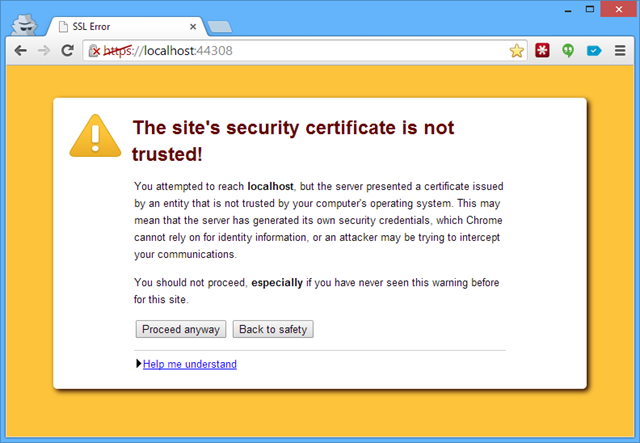 You also have both an SSL endpoint and a regular HTTP endpoint. Simply hit F5 now to debug. The default configuration here will bring up the SSL endpoint. Let’s explore what happens below. Web Browser, Please Protect Me! This says, in a nutshell, only allow authenticated users access to my site, and if they are not authenticated already, send them to the configured AAD login screen. 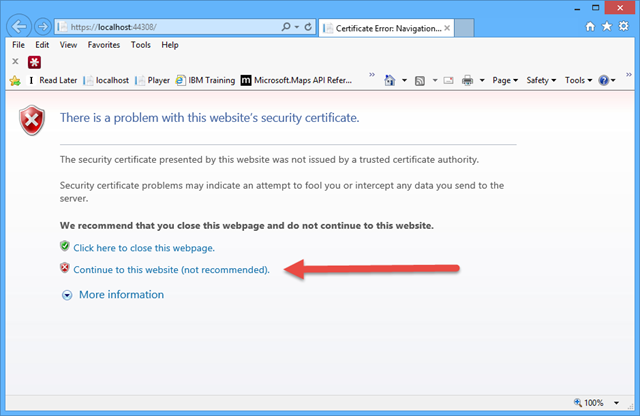 What does this mean – SSL without the padlock? It means your data is cryptographically secure on the wire (safe from snooping, because the channel is encrypted), but you are sending your data to a web site whose identity has not been independently verified. Hit F5 from Visual Studio if Chrome is your default browser (or type the appropriate URL into Chrome while debugging from Visual Studio). Hit F5 from Visual Studio if Firefox is your default browser (or type the appropriate URL into Firefox while debugging from Visual Studio). Before we get rid of the warning, let’s cover a couple of basics. 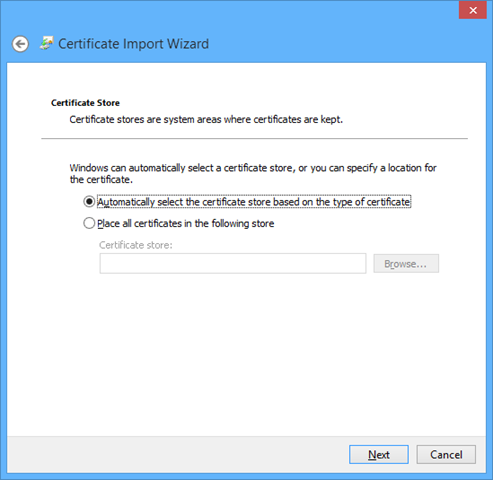 We’ll use Internet Explorer to make the fix, but realize that since all browsers are using the same underlying Certificate Store on Windows, you only need to do this ONCE (in IE in our case) and the others will also automatically trust the certificate for SSL. 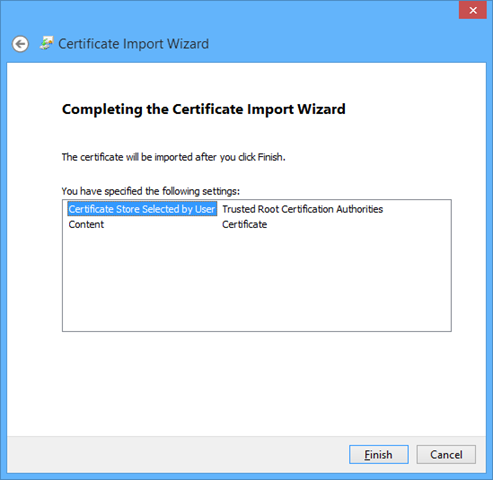 Here’s the core of the tip in this article, and it starts at the point after you’ve hit F5 in Visual Studio, and assumes IE is configured as the default browser (and, if not, simple load the page into IE before proceeding). Click Next (Current User is desired location). 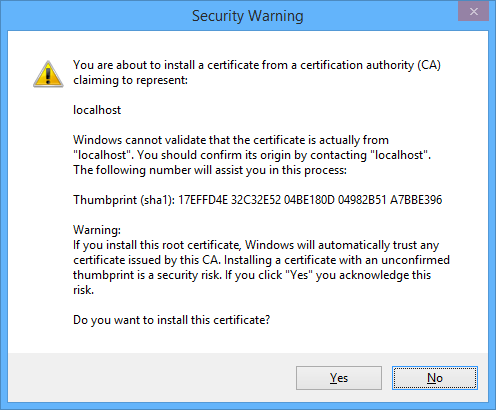 Choose Trusted Root Certification Authorities. Click OK.
Now read it. If you are cool with it, click Yes. This entry was posted in Identity and tagged #StupidAzureTricks on March 14, 2014 by Bill Wilder.